These gas pedal assemblies are designed to bolt into the 1967-69 Camaro stock location on the firewall, allowing conversion from rod linkage to throttle cable linkage. 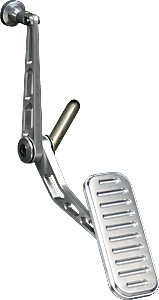 Gas pedal is spring-loaded like OE and splined for right or left adjustment of foot pad. Billet aluminum brake, parking brake, clutch, and throttle pedal pads are machined to fit directly over stock Camaro steel pads. Does Lokar BAG-6095 fit your vehicle?